I found two amazing scriptures on Pinterest today that only complimented each other but follow so perfectly the scripture from yesterday. A scripture and a promise this Friday. I love Hebrews. If you haven’t sat down to read it, or have read bits and pieces, take time to read entire chapters when you can. This book is so full of wisdom and encouragement, heart ache and redemption…. It’s a good one. The verse after this scripture talks about how Jesus looked past His work on the cross, and saw the joy that was to come. Then our writer tells us to look to Jesus when we struggle so that we can continue without growing tired. Look to our Savior who endured the most humiliating and excruciatingly painful death death, who endured His own people betraying and leaving him, who was a constant target of ridicule. If he endured so much, can we not endure the struggles and heart aches put in our path as we work to complete the tasks God has set before us? Can we not look at these very real struggles and hurts as brief and passing so that we can continue to work joyfully as unto Lord? God gave each of us a task, He has a plan for us all. All we need to do, is like my friend Wynne says, is “say yes”. And, believe that whatever road blocks are put in our path, they are to mold us to look more like Christ and bring that much more glory to our Father. 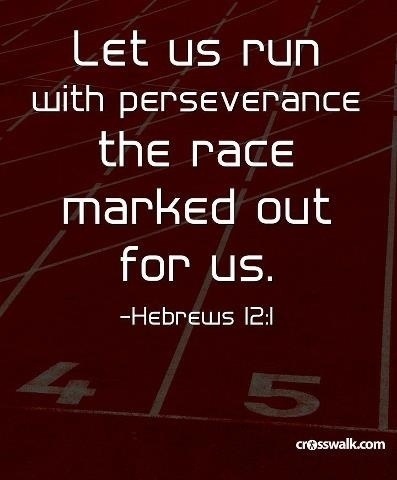 Often when we are working so hard to get through and serve in whatever capacity God has given us, we do grow weary. We tire out. We get to a point that scares us to death. We feel that we’re walking a new path alone. And, sometimes are. Sometimes, we’re working to do what’s never been done…. And it gets scary and tiring and lonely. I wondered why so many times we are told that God is with us. Not to be afraid. To JUST GO! (An Alaina-ism) or SAY YES!!! (A Wynne-ism). Sometimes we can “say yes” but allow so many molehills to become mountains and we don’t actually end up doing much. But God promises that He is with us. I liken it to a group of girls going to the restroom together or college aged kiddos taking a class – we want to do it with someone. There is strength and confidence in numbers, right? The class is much more fun with your friends and you never know who you’ll run into on the way to fix your hair & apply more gloss!! Lol. God knows us. He knows that we will want companions and support and encouragement. And, although He gives us communities to be Earthly voices of wisdom and who will sit on our beds and talk (cry/wail??) it out or just bum it out on the couch to watch movies—– He also knows that we will need the confidence of someone who will never leave us nor forsake us. A voice that is above all others, one that carries more weight and more melodic than the loves of our lives. He knew we’d want someone with us who knew where we were going. Who could tackle any enemy, mean girl, or give us enough confidence to approach the most amazing opportunities that makes our insides quake. And, then He says, He will silence us with His love. I literally LAUGHED OUT LOUD!!!!!! Because we tend to freak out, over analyze, over talk, talk ourselves out of, complain, and just downright work ourselves into fear and frustration. 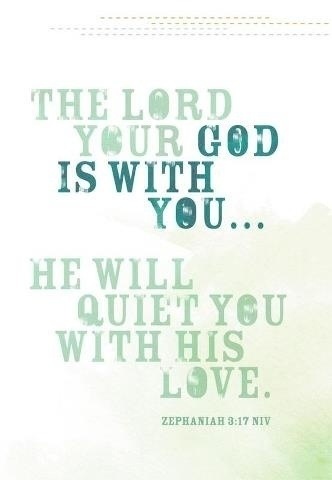 But, He will quiet us! Our anxieties, the “what ifs”, the voices of reason that try to prevent us from stepping out on faith. Sometimes, we can be our own worst enemies. But, The Lord envelopes us into His arms and comforts us, he rocks us and silences us with His gentleness, mercies, and love. … And um…… How many of you went back to your middle school years and thought about all of the circumstances you wanted friends with you? Or, thought about a time you freaked out about something and someone had to calm you down? Lol. …. Here’s to complete gratitude for the amazing examples God has given us to show us what it looks like to trust & obey without reservation knowing His glory will be seen by all men… And, that he promises to be with and comfort us as we run the race He has assigned us.